If you read yesterday's article, you know that I ran across a treasure trove of gorgeous Friesian photos at Callyspictures.com. I was so impressed I contacted the photographer Cally Matherly -- a Friesian owner with ties to the breeding world. She travels throughout the U.S. and to the Netherlands and photographs about 400 Friesians at keurings, including many of the approved stallions. The photos on the right in this article are hers. We had a lengthy email exchange on the subject of Friesians -- she graciously shared her perspective with me. The old style Friesian, (see example on right a a mare), tends to be downhill, with short front legs and a steep shoulder that makes extended work difficult. Just below that picture is another of "a very sporty" approved stallion--modern, tall, and built uphill. There is a down-side to the modern silhouette, however. In getting the lighter, dressage-y Friesian, CM jokingly laments that "we are losing hair." Feathers are a defining characteristic of the breed, and the purists in the Netherlands are concerned. As an aside, CM notes that the older type Friesian with more fetlock hair and mane is also known for water or swelling in the fetlock joints. The Dutch call it sponginess. 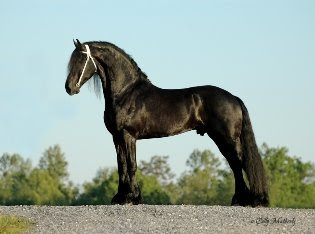 "The U.S. does have some pretty shady crossbreeding going on, so to get a Friesian sporthorse cross you need to be sure the stallion is a good one....People need to be smart when selecting a Friesian to breed to--and the rock bottom stud fee is not going to get you quality!" CM notes one type of cross that seems to be all the rage in Europe. The Arabo Friesians -- 3/4 Friesian and 1/4 arab -- are "tearing up [European] competitions in driving and dressage." In Europe and the U.S., Friesian breeder participation in shows is low. The IFSHA is the show circuit thru USEF, and CM says that "hardly anyone shows in it." Keurinigs are the real testing ground for quality. 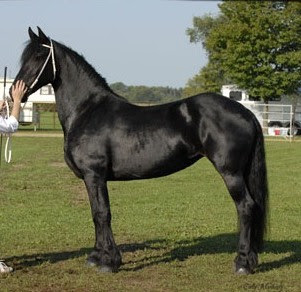 Vanderploeg Friesians is an example of a Friesian breeding farm that demonstrates its quality breeding program through keurings and inspections. The farm has bred 2 approved stallions (only 1% become approved), and they have had several make it to the 2nd round of judging. Note: Only 2-3% make it to that round, so it is very competitive. 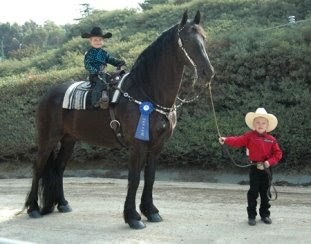 The farm bred a stallion that did show in the Netherlands, where he made reserve champion at the annual stallion show. "It's quite an achievement for a U.S. bred Friesian to get 2nd out of all the approved stallions," says CM. I love hearing of breeds that I'm unfamiliar with. My preference? I'm a fan of the quarter horse and the thoroughbred, or a cross between the two. However, I am a fan of Arabian and the Lipizzan just because of their beauty and difference. More recently, the name Gypsy Vanner has floated where my ears could pick up on it. I often say nothing but check things out when I hear them drop in conversations I don't belong in. In other words, I eavesdrop. :) Can you share what you know about this peculiar breed, if anything? Just an idea for a post or two. I no longer subscribe to magazines, but I remember how Alice (is that her name?) at Iron Springs Farm seemed to get really smitten with the Friesans. (The best part of the stud issues was Iron Springs Farm.) Makes me wish I could see what she has now. I can really see the leetle bit of Arab in the Arabo. Changes the neck and head set. (I hate that term head set, but I think you know what I mean.) I think I'll go do a search for Iron Springs Farm. I went the the ISF website, almost a trip back in time too, but lots of Freisans. Looks like Alice is still having a great time with her horses. The one stallion, Teade, has an amazing mane. Interesting to see it braided when he's dressed up. Lots of eye candy on that site. I was a little surprised that the popular cross in Europe is with an Arabian. Seems usually it is with TB blood. I wonder what kind of Arabians. Who can't help but love Martha Stewart's Fresian's? Here is Conan and Martha. I don't always like Conan's potty mouth, but this is pretty funny. I do love Martha's Fresians. I always thought that Friesians were stunning horses and always pictured a knight or a princess riding one. Do you think the folks who are breeding crosses are actually wanting to make a Friesian into a breed that already exists? For example, standard poodles, and portugeuse water dogs are very smart and great family dogs and hypoallergenic...they don't need to be breeding labradoodles. People just don't bother to educate themselves. I fell in love with Friesen horses after seeing Rutger Hauer ride one in Ladyhawk. 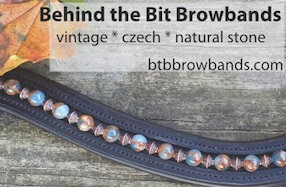 Thank you for this post on the breed.